With the exception of our companion animals and the wild and stray species within our urban environments, we experience animals daily only as the food, clothing, animal tested goods and entertainment we make of them. This moral dilemma is largely hidden from our view. THE GHOSTS IN OUR MACHINE illuminates the lives of individual animals living within and rescued from the machine of our modern world. Through the heart and photographic lens of animal rights photojournalist Jo-Anne McArthur, audiences become intimately familiar with a cast of non-human animals. From undercover investigations to joyful rescue missions, in North America and in Europe, each photograph and story is a window into global animal industries: Food, Fashion, Entertainment and Research. THE GHOSTS IN OUR MACHINE charts McArthur’s efforts to bring wider attention to a topic that most of humankind strives hard to avoid. Are non-human animals property to be owned and used, or are they sentient beings deserving of rights? Tickets: Entry by donation. Please arrive early as capacity is limited. We will have delicious dairy-free Daiya Cheesecakes for you to sample at the event. The cheesecakes were generously donated by Vancouver company, Daiya Foods, and the compostable plates and cutlery generously donated by Whistler company, Slope Side Supply. THE GHOSTS IN OUR MACHINE – Official Trailer from THE GHOSTS IN OUR MACHINE on Vimeo. 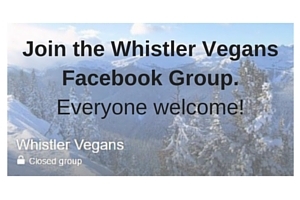 Earthsave Whistler is a chapter of Earthsave Canada, a non-profit, educational organization promoting awareness of the environmental, health and ethical consequences of our food choices.